A contemporary piece which showcases all of the assets of modern Italian violin making, this workshop instrument by Franco Albanelli is quite young, having been made in 1997 in Bologna. It is an impressive musical calling card by a liutaio of this generation who has established a solid reputation for himself far beyond his home. The drawn-out beesting corners shape the striking character of Franco Albanellis personal interpretation of the classic Stradivari model which he studied intently and knew how to implement with confidence. The mildly flamed maple selected for the one-piece back and ribs is set in its finest light under the extremely transparent and luminous orange-brown oil varnish, beautifully applied. 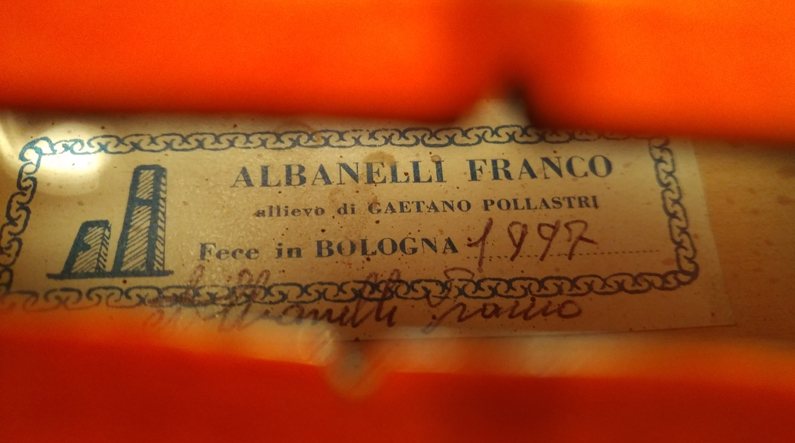 The original Franco Albanelli label in the body confirms the authenticity of this undamaged and crack-free instrument we carefully set up. It is compelling with its bright voice, blending its medium potential with a pleasantly sweet note to a good player. We recommend this affordable instrument of unmistakably Italian provenance to collectors and lovers of Italian contemporary instruments.